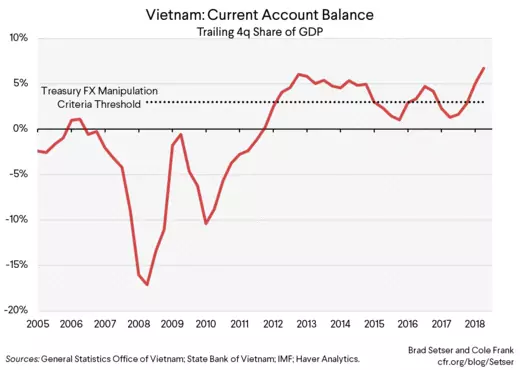 Vietnam appears to be taking a page out of China's post-WTO playbook by intervening to keep its currency weak and its exports strong. Rapidly growing exports of a range of manufactured goods, especially to the United States. Check. Modest imports from the U.S. and a growing bilateral surplus with the United States. Check. And rapidly growing reserves. Check. At least in the past few quarters. Vietnam’s reserves rose from around $30 billion at the end of 2015 to over $60 billion now, thanks to large purchases in late 2017 and early 2018. And there are hints that Vietnam, which doesn’t disclose using the IMF SDDS reserve template, may have a hidden forward book as well. 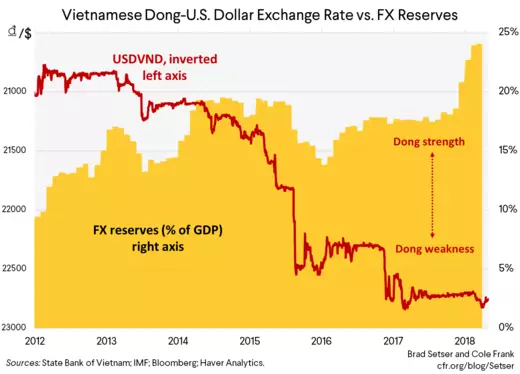 That intervention came even as the Vietnamese dong depreciated a bit against the dollar this year (Vietnam was reacting to the dollar’s broad strength), and more recently worries that yuan weakness might undermine Vietnam’s export success. A bilateral surplus with the U.S. of over $20 billion (see graph above). A current account surplus of more than 3% of GDP. And intervention in excess of 2% of GDP. To be sure, there isn’t a “Vietnam” shock working its way through the U.S. economy in the way the China shock did fifteen years ago. Vietnam is a much smaller economy. Its exports to the U.S. are up significantly, but still only totaled $50 billion last year. And there isn’t a lot of current overlap between the goods produced in Vietnam (by companies from around the world) and the goods produced in the United States. Vietnam’s exports right now are mostly displacing exports from other Asian countries. Sectors that disappeared (from the US and much of Europe) in the first China shock cannot disappear again. Vietnam in fact stands to gain if U.S. goes ahead and implements tariffs on China, at least if China’s currency stops weakening against the dollar (and the Vietnamese dong). Trade diversion and all. Vietnam is now a big furniture exporter, and furniture is on the $200 billion tariff list. Apple (or rather Honhai, which makes phones for Apple) eventually might even join Samsung and start doing final assembly of its phones in Vietnam. If it did final assembly in Vietnam while making increasing use of Chinese components, like say touch-phone screens, the Chinese value-added of an iPhone might even rise (a Trump era win-win?). 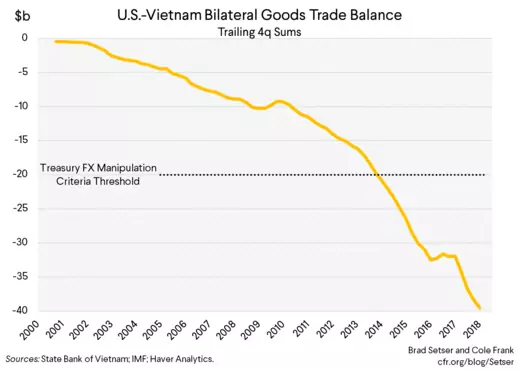 Yet even if rising imports from Vietnam aren't displacing U.S. production, Vietnam’s decision to intervene heavily to keep its currency pegged to the dollar at an artificially weak level still imposes a cost on the U.S. economy. The weak dong makes it harder for Vietnam to afford imported U.S. capital goods. 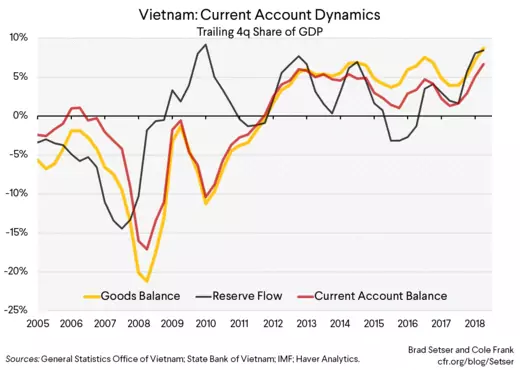 And holding its currency down helps Vietnam remain in overall surplus, which means that Vietnam isn’t absorbing the excess savings of the rest of Asia. Instead it is joining Korea, Taiwan, Thailand, and others and exporting its spare savings to the U.S. (and in the process helping to fund the U.S. budget and trade deficit). Think of it this way: right now rapidly growing Vietnam isn't importing as much as it could from the rest of Asia, and that's creating economic pressure that pushes the wealthier and older Asian economies to export more to the United States. And, well, it is better to nip bad habits in the bud. Vietnam shouldn't let its export sector get too dependent on an exchange rate that is artificially being held down. One side note: the IMF’s external assessment is out. And not surprisingly the Eurozone’s big surplus countries—Germany and the Netherlands—are the countries with the largest “excess” surplus (a larger surplus than the IMF thinks would be desirable, given a country’s demographics and other characteristics). Taiwan would be on that list too if it were a member of the IMF. But Thailand, Singapore, and Korea all made the list, and they too are part of Asia’s axis of ongoing foreign exchange intervention. That’s why I don’t think “currency” is a dead issue. It obviously matters less when the market is bidding up the dollar and Asia can weaken “naturally”—and most of Asia ends up facing pressure to depreciate when China is depreciating. But when the dollar is naturally depreciating, a number of Asian surplus countries don’t want their currencies to go up—and they still step in to block the move. 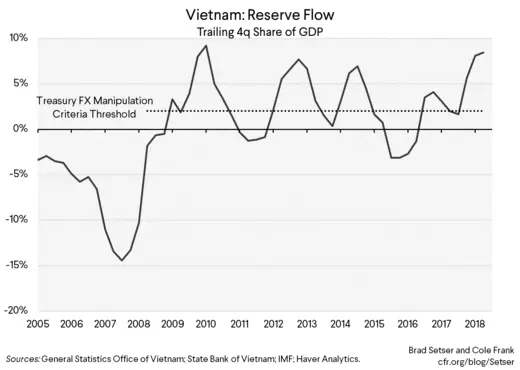 */ According to the IMF, Vietnam should still be slowly adding to its reserves (as it transitions to a more flexible exchange rate) as its reserves, at around 25% of its GDP, falls short of the levels suggested by the IMF's reserve metric. But this is another case where in my view the IMF's reserve metric overstates the reserve need of a surplus country. Vietnam's short-term external debt would be fully covered by reserves of 10% of its GDP. While Vietnam needs reserves equal to 35% of its GDP to cover m2 (Asian surplus countries tend to have a high level of m2 relative to GDP). E.g. Vietnam, a surplus country, ends up having a much larger reserve need (relative to its GDP) than Argentina, a deficit country. Thanks to the EBA process, the IMF is doing a better job of external surveillance these days ... but it continues to be handicapped by the technical choices made in the construction of the reserve metric a few years back.